We’d love your help. 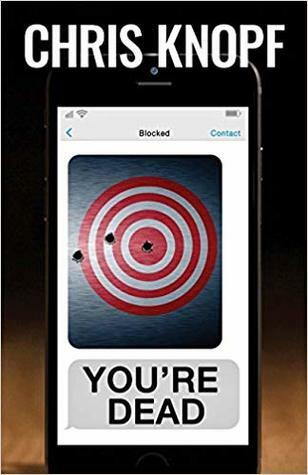 Let us know what’s wrong with this preview of You're Dead by Chris Knopf. To ask other readers questions about You're Dead, please sign up. Dr. Waters (“You can call me Waters. Everyone else does”) is the obvious innocent suspect in Chris Knopf’s novel, You’re Dead. He’s not dead, but his boss very clearly is. And the evidence, such as it is, keeps mounting as if Waters had truly killed his friend. Waters specializes in analyzing personalities, specifically the personalities of people his boss might employ. He’s good at his job. Maybe that’s because he’s good at analyzing himself—an autistic child, grown up to successful adult. He al Dr. Waters (“You can call me Waters. Everyone else does”) is the obvious innocent suspect in Chris Knopf’s novel, You’re Dead. He’s not dead, but his boss very clearly is. And the evidence, such as it is, keeps mounting as if Waters had truly killed his friend. Waters specializes in analyzing personalities, specifically the personalities of people his boss might employ. He’s good at his job. Maybe that’s because he’s good at analyzing himself—an autistic child, grown up to successful adult. He always knows what he’s doing and why. He’s always honest, even when he’s acting against the law. And his questions are always what you wish you’d thought to ask. But he still keeps secrets, and one deep secret will drive him to find out the truth of more than what happened to his boss. You’re Dead is a novel of losses analyzed and resolved, and of gains put to good use. It’s a tale of honest police work limited by time and finance; of good people, kindness and crime; of clever analysis, and the innocence of a child’s drawing—“usually… the manifestation of helpless, uncontrollable love.” Ultimately it’s a novel of love—lost, found, betrayed, and hoped for… the well-analyzed love of a man whose real emotions are as foreign a land as the picture on the fridge. When the picture comes down at the end, the reader longs for more just as surely as the protagonist does. A fascinating mystery, made more fascinating by its plotting and characters, You’re Dead is highly recommended. Disclosure: I was given a preview edition and I offer my honest review. This one starts immediately with the crime and goes uphill from there. Organizational psychologist and one-time diagnosed autistic Waters ("no title, no first name, just 'Waters'") comes home to find his boss' bodyless head on his bedroom floor. At first Suspect #1, Waters sets out to discover who killed his boss and why, weaving a path through beautiful women, ruthless tycoons, and jealous Significant Others. The little background we get on Waters reveals a man who, with the aid of his brother' This one starts immediately with the crime and goes uphill from there. Organizational psychologist and one-time diagnosed autistic Waters ("no title, no first name, just 'Waters'") comes home to find his boss' bodyless head on his bedroom floor. At first Suspect #1, Waters sets out to discover who killed his boss and why, weaving a path through beautiful women, ruthless tycoons, and jealous Significant Others. The little background we get on Waters reveals a man who, with the aid of his brother's determination, rises above and conquers his autism. The mystery of his brother's disappearance/death also leaves the door open for another novel if the author chooses, and if he does, it should be as overwhelming as this one. You're Dead is a story reminiscent of the old crime noir novels of Chandler and Hammett, with plenty of twists and turns, deaths and betrayals, and beautiful but deadly female, brought together in a totally unexpected finale. This one misses being a complete "hardboiled detective novel' only because the protagonist isn't a detective by trade. Dr. Waters discovers the bodiless head of his boss when he goes home. He becomes the first suspect, and decides he needs to find the real killer before he’s arrested for the murder. The case becomes a fantastical investigation, as only the author can pen them, and would have been a first rate detective novel. The publisher went me a book for an honest review. I’ve never cared for the author’s dialogue, but his fiction is certainly topnotch, if not a little beyond belief, but that’s why we read - Dr. Waters discovers the bodiless head of his boss when he goes home. He becomes the first suspect, and decides he needs to find the real killer before he’s arrested for the murder. The case becomes a fantastical investigation, as only the author can pen them, and would have been a first rate detective novel. The publisher went me a book for an honest review. I’ve never cared for the author’s dialogue, but his fiction is certainly topnotch, if not a little beyond belief, but that’s why we read - to escape reality for a few hours in an action-packed mystery with beautiful women and hard men. Highly recommended. I love the main character's voice: a very high-functioning Autistic man who got his doctorate in psychology because he became so good at reading others (without ever really quite becoming a neuro-typical). He's not a cop, but he has a skill set uniquely qualifying him to outwit a sadistic killer out to first frame him for the murder of his boss, then kill him outright. I enjoyed this book as I have many of his books. It was a good fast paced thriller. It was a quite complex mystery with an interesting group of characters.